There are currently 84,999 users on this website. Howdy ya'll! Just joined and saw this thread. Did not read every page but enough to interest me. My dad left my more 5 rolls each of Presidential dollars. There's a safe full of them. I'm told he bought them every year as soon as they came out, all from the mint unopened previously. We are/were going to take them to the bank to cash in, but reading this, I should go through them? 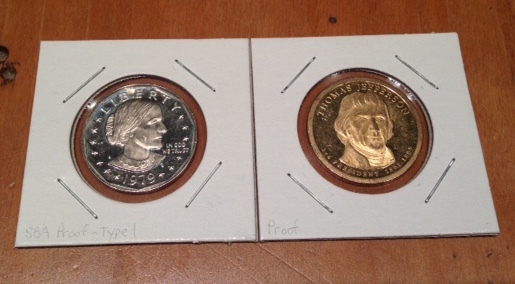 Are there errors/proofs worth $$? When I was back there a month back, I called all the coin shops around there and was told take to bank, they did not even want to buy them at face value, said they can't give these things away. What should I do with them? Also, alot of terms I'm seeing, I say, HUH? I guess I should go to the intro thread and introduce myself, there's another story about dads coins. Definitely look through them! If you have any questions or any of them seem interesting, feel free to ask us. No question is wrong. To the best of knowledge only the Washington and Adams had a known error with double or missing edge lettering. I think that original mint rolls are less likely to contain those because the errors were discovered in circulation. If you are going to bring to the bank to cash out, it would not hurt to look for some of the striking errors that occasionally occur with any coin. Such as struck through debris/grease, rotated die, brockage, capped dies, etc. While there isn't a higher percentage chance of finding them in an original roll IMO, if one is found, the condition will be uncirculated which will make it more valuable. Did $500 of Fed wrapped dollar coin rolls from a new bank. Found a handful of nice barely circulated coins. An interesting observation, with this group I have probably search approximately $2000 of dollar coin rolls and have yet to find any presidential coins from 2012, 2013, or 2014 It looks like the mintage was lower these years, but not one coin yet. Anyone else observing this? 2012 on were NIFC's , not issued for circulation, you find any, someone dumpe it from a mint set or mint rolls. Thanks Crazyb0 I didn't know that. Appreciate the info! Nice impaired Proofs CambriaMarket! Good finds! There was nothing special in the rolls. Also ordered a box that I will pickup next week. You were and then so we are . Seems they have a minimum order of 2 boxes. Picked up my order Wednesday, and finished looking through them Thursday. Interesting batch. Good think you like to spend them. I like to spend them and the $2 bills. Keeps cashiers awake. Interesting finds Fuzzy317! I hope you score well on your next batch!